and a freezing temperature underneath the storm. 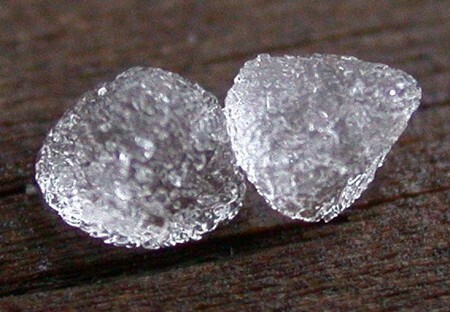 Hailstone begins from a nucleus of ice, then it turns into a chain of freezing cold water. Much later this water turns into a ball of snow. Hail’s center is called a graupel. Hail continues to ball up, and melts in the thick of a thundercloud until it turns into rain. In the process this ball of ice gets smashed by other graupels. If a piece of it scatters in a storm cloud, there results another would-be nucleus for a hailstone. In cases where a thunderstorm forms somewhere between strong winds and freezing temperature, we have hail nucleus balling up to a bigger ice through a process called accretion. At this stage hail appears dirty white with several layers that form because of trapped air bubbles. They stick to the graupel. These layers have extremely cool water inside that further hardens when it merges with other hailstones. At times we see unnaturally larger hailstones forming. There are times when hail is formed from rain droplets that are carried up further by an updraft wind. Here you have a strong wind that goes as fast as 100 mph or stronger. Like the other process, the frozen water gathers more moisture until the ball gets too heavy for the wind. Then it falls down as hail. Hails sizes vary. They may be as small as pinheads to something as big as softballs. Sometimes you see the outer layers melt when hail blends with other “warmer” snow, rain, or atmospheric liquid. Aside from giving you visual pleasure, hail also gives you an inside look at how thunderstorms are formed. This way meteorologists are able to understand how storms grow. Hail doesn’t occur only in cold countries at a certain time. Even in temperate counties like the Philippines hail unpredictably falls. But hail is most common in the United States. Most times hail occurs late in the afternoon. While most hailstorms are not essentially risky to lives and property, it may get to a point where it could hurt you physically. What you need to do is to run for cover in a low place. What makes hail a physical threat isn’t so much its temperature but the speed at which it goes.